Chocolate. Guinness. Bailey's Irish cream. When you marry them all together, you get the ultimate dessert. Chocolate Guinness cupcakes filled with an super luscious and silky Irish cream chocolate ganache, and topped with an Irish cream buttercream. I first saw this recipe two years ago on Smitten Kitchen and have always wanted to make them, but didn't get around to doing them until this year. While you don't taste a lot of the Guinness in the cake, you do get a hint of malt flavour, and the beer and sour cream makes for an extremely moist cake. My favourite is the chocolate ganache, which turned out so rich and silky smooth—much like chocolate pudding. It's a nice surprise when you bite into the cupcake and get to the creamy center, and looks absolutely gorgeous when you get the cupcake in half. 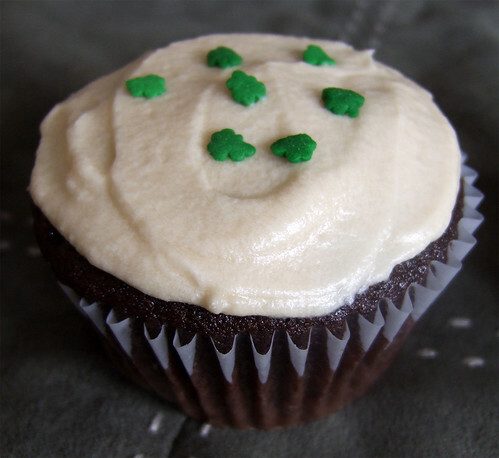 The Irish cream buttercream is absolutely delicious and compliments the dark, chocolatey cupcake very well. This is a super decadent cupcake and should really be reserved for special occasions. But St. Patrick's Day is a good enough excuse to celebrate with these rocking cupcakes! In a bowl, sift together the flour, cocoa, baking soda and salt. Set aside. In a large, separate bowl, cream together butter and sugar with an electric mixer until light and fluffy, about 3 minutes. Add the eggs in one at a time, mixing to incorporate after each addition. Mix in the vanilla extract. With your mixer on low, slowly add in the Guinness. Don't panic when it curdles. It will all come together again when you add in the flour and sour cream. Now slowly add in a third of the dry ingredients and mix until just incorporated. Mix in half of the sour cream. Repeat again by alternating between the dry ingredients and the sour cream, finishing with the dry ingredients. Mix until just combined; do not overmix. Spoon the batter into the lined cupcake tins, about 2/3 to 3/4 full. Bake in the oven for 20 minutes, or when a toothpick inserted into the centre of a cupcake comes out clean. Remove the cupcakes and allow to cool in their tins on a cooling rack for 5 minutes. Remove the cupcakes from their tins and cool completely on the racks. To the make the ganache filling: Finely chop the chocolate and transfer it to a heatproof bowl. Heat the cream on medium-low until simmering and pour it over the chocolate. Let it sit for one minute and then stir until smooth. (If this has not sufficiently melted the chocolate, you can return it to a double-boiler to gently melt what remains. Add the butter and Irish cream and stir until combined. Let the ganache cool until thick but still soft enough to spoon into the cupcakes, about the consistency of pudding. Meanwhile, use a small teaspoon to scoop out the centres of the cooled cupcakes—aim for about 1/2 to 2/3 of the way in depth. Reserve the scooped out cake (so you can munch on it yourself!). 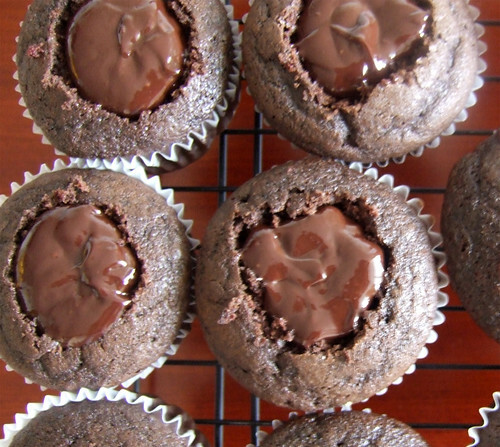 Spoon the ganache into each cupcake and set aside until ready to frost. To make the buttercream: Whip the butter in the bowl of an electric mixer or with a hand mixer until light and fluffy, for about 5 minutes. Slowly add the powdered sugar, a few tablespoons at a time. Slowly drizzle in the Irish cream and mix until the buttercream starts to come together and look thick. If it looks too thick, add a bit of milk or cream. Ice and decorate the cupcakes (if you want to pipe the buttercream, I'd suggest that you double the recipe of the buttercream). Enjoy! Anonymous March 15, 2011 at 1:14 p.m.
Jing March 15, 2011 at 5:38 p.m. Sounds like chocolaty decadence! Great for St-patties! Andrew March 17, 2011 at 1:11 a.m.
STAY AT HOME CHEF March 22, 2011 at 10:17 a.m. 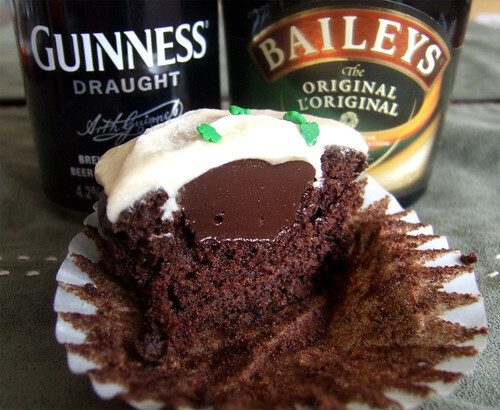 Okay can we rewind time and go back to St. Paddy's Day just so I can make these?! This year I made a gingerbread cake with Guinness and it turned out so lovely and moist. But I think I may just have to put on some green and 'pretend' it's March 17th because I won't be able to wait a whole year to make these cupcakes. Bonita March 22, 2011 at 9:44 p.m.
Mmm...gingerbread with Guinness. That must have been amazing Jasmine. But yes, you need to make these cupcakes. They're to-die-for!